Well, that is it. 2 days of great music and fun. 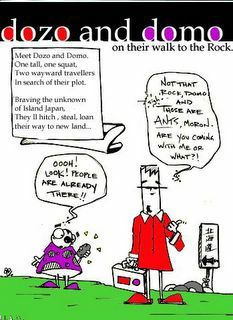 But, be sure to check this site out for follow-up photos and info about other concerts and shows in northern Kyushu. Just off of the Rt 10 By-pass at the top of Mt. Hachimen. 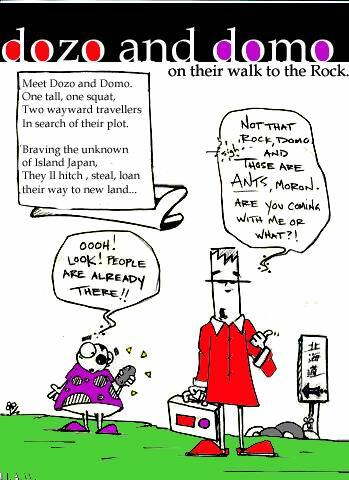 D and D - FROM HOKKAIDO TO KYUSHU WITHOUT PANTS. 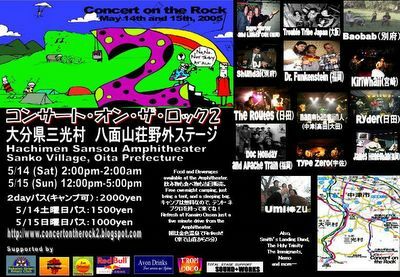 What is Concert on the Rock2? 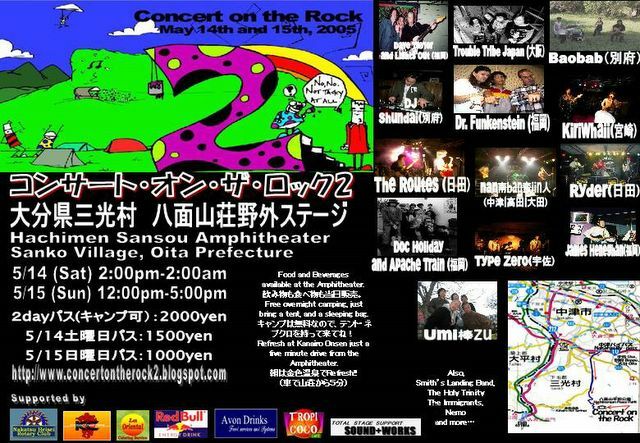 Concert on the Rock 2004 brought some of the best musicians from Kyushu together for a night of excellent music, dancing, and fun. The proceeds from the concert went to Sei Jou En Children's Center in neighboring Nakatsu City. Musicians and DJs came from all over Kyushu and played everything from dub to folk to funk to punk to psychodelic rock and bluegrass to country to straight up blues. In our second attempt to move the Rock with ROCK! Were planning on more of the same great music and entertainment spiced up by a few new friends we've met along the musical path. 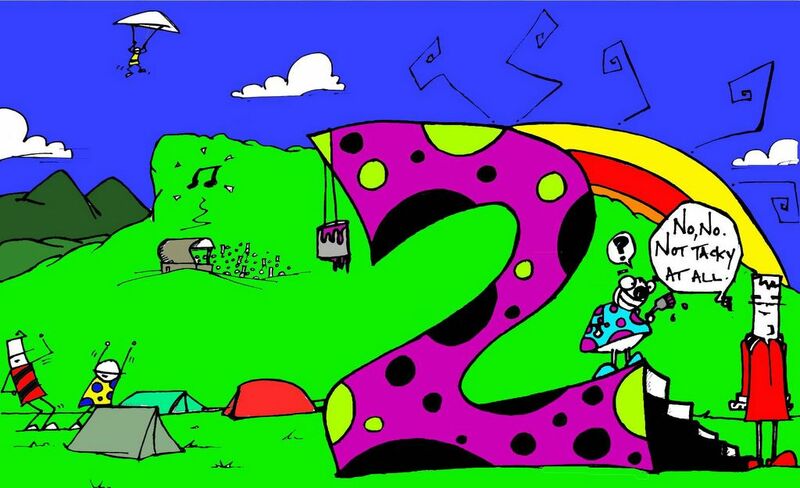 When is Concert on the Rock2? Saturday, May 14th. Start around 2:00pm. DJs begin at 11:00pm. Sunday, May 15th. 12:00pm. to 5:00pm. How Much is Concert on the Rock2? 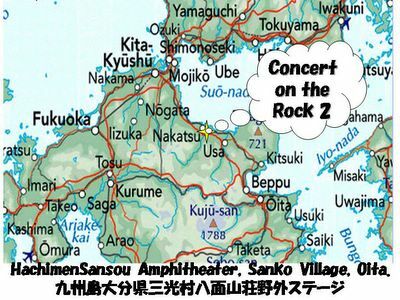 Where is Concert on the Rock 2 ? Sanko Village is in northern Oita prefecture and, along with it's neighbor Nakatsu City, is right on the Fukuoka/Oita Prefectural border. 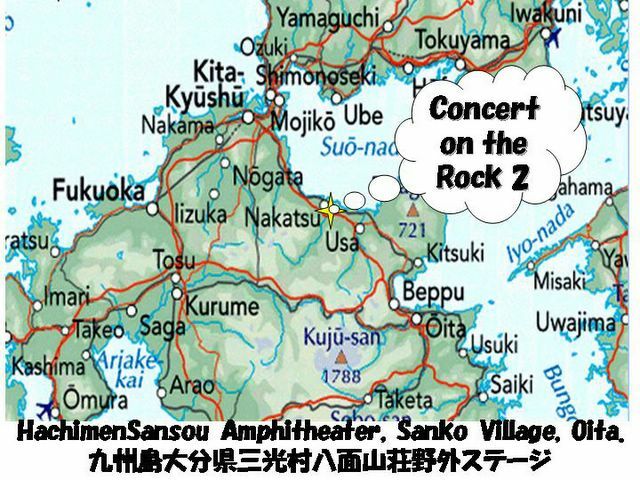 How do I get to Concert on the Rock2? From Western Kyushu: Saga, Nagasaki, Kumamoto, Kagoshima, Okinawa, Taiwan, and The Philippines- take the Kyushu Expressway to Hita City. From there follow Rt. 212 North toward Nakatsu City and Sanko Village. Take a right on to the Rt. 10 Bi-Pass just past Aeon JUSCO. From there go toward Oita and Beppu and watch for signs for Hachimenzan (which will appear on your right) about 5-10 min. later. 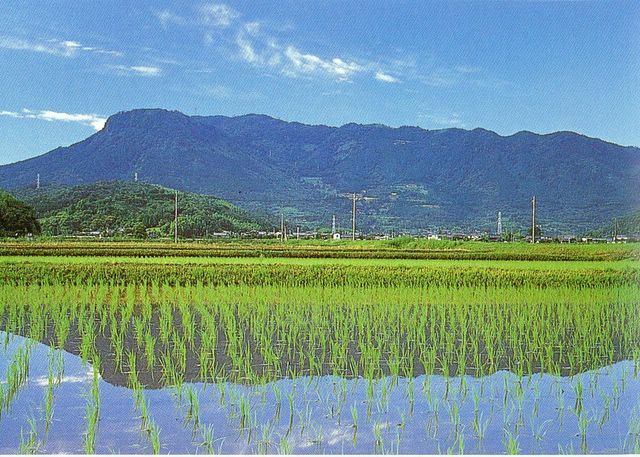 (right around 2 hours from Saga City, allow more time for Taiwan and The Philippines). 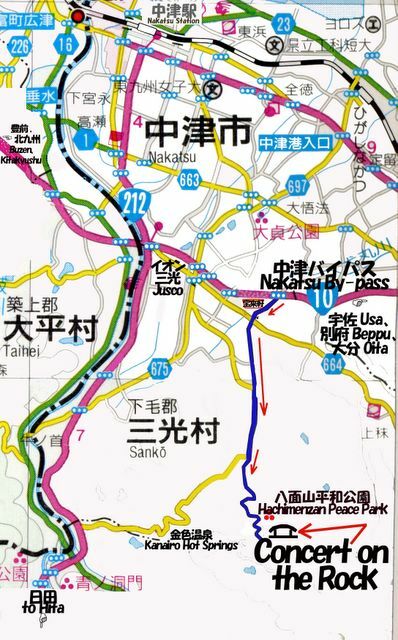 From Eastern Kyushu: Beppu, Oita, Saganoseki, Miyazaki City, and Miyakonojo- Take Rt.10 (or faster alternative) North toward Nakatsu and Sanko, be sure to follow the Bi-Pass Toward Kitakyushu City, just past Usa City. There will be signs for Hachimenzan (which will appear on your left) about 10-15 minutes later. From Shikoku: Take a ferry to Beppu or Oita and follow the Eastern Kyushu instructions. From Kitakyushu: Yukuhashi, Kokura, Moji- Take Rt. 10 Toward Nakatsu, Beppu, and Oita. Follow the Shiida By-Pass from Yukuhashi all the way to Sanko Village. You will see Aeon JUSCO on your right as you enter Sanko Village. Continue on and watch for signs for Hachimenzan (which will appear on your right) about 5-10 min. later. From Shimonoseki and Hiroshima: Take the Expressway to Kitakyushu and follow the Kitakyushu instructions. Nakatsu City is on the JR Nippo Honsen Train Line. There are buses and Taxis available to take you from Nakatsu Station to the Peace Park (Heiwa Koen) on Hachimenzan (Mt. Hachimen). It is a very short, but scenic walk from the Peace Park to the amphitheater above. We will post the times of buses as soon as they are confirmed. Where can I sleep at Concert on the Rock 2 ? On-site camping is available for those with tents or other camping aparatus. Also, reservations can be made to stay in the lodge above the amphitheater. A reservation will get you a place to store your belongings, futons, and a nice onsen-bath overlooking Nakatsu City (first come first serve basis). Prices to be posted later. Contact Rich at concertontherock2@hotmail.com if you're interested. A number of JETs live in the Nakatsu, Sanko, and Usa area. Give one a call and beg for floor space. Finally, Business Hotels as well as Love Hotels (think of them as travelers' hotels) can be found for reasonable prices in and around Nakatsu City. Questions? Want to play at Concert on the Rock? Tickets? Send us a comment. We'll get back to you!! This page will be updated regularly. So, please check and see what is new.